Nature has made the northwest corner of Illinois and parts of Wisconsin, Iowa and Minnesota the perfect environment for mining and excavation of its geological resources. Ice age glacier drift left this area untouched (known as the Driftless Area) producing a plateau of bedrock composed of limestone (or dolomite) and shale, fused by sedimentary compression. Following the ice age period — eons ago, our local area was covered by a relatively shallow tropical ocean. Biological limestone is sedimentary organic rock formed by the accumulation of calcium carbonate shells, coral, algae and skeletal debris. Their biological origin is often revealed in the rock by the presence of marine fossils. Many of these fossils are known as cephalopods – looking like giant octopuses or squid in hard “ice cream cone” shells. As these and other shellfish died, they left great thicknesses of sediment, forming layers of stone, in which many beautifully preserved seashells can still be seen from the time of ancient Illinois oceans. 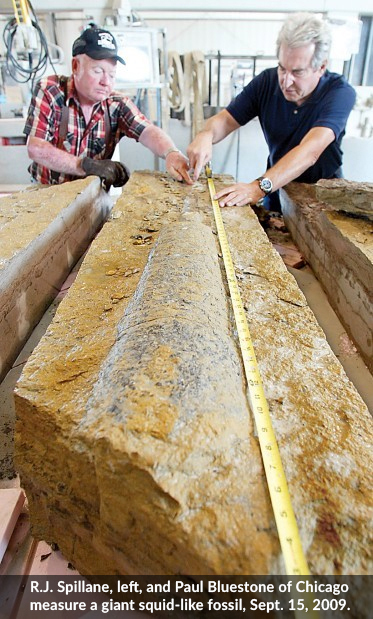 In 2009, R.J. Spillane, the founder of what is now the Stagecoach Trails Limestone quarry, discovered a 5-foot-long fossil of a cephalopod. When it lived, the mollusk had a soft base body and a hard shell. The fossil protrudes outward and is easily visible on the surface of the 2,100 lb. rock retrieved from our quarry in Apple River, Illinois. The specimen is now on display at a nature center in the Chicago area. Limestone is the leading stone produced in the U.S., accounting for 42% of total domestic production. The most common use for limestone is rough block for building, landscaping and construction. 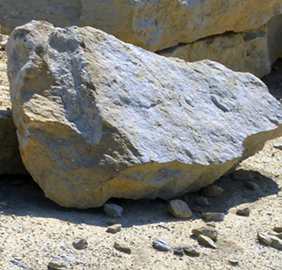 An important secondary market is crushed quarry stone used for roadbeds and other municipal and commercial applications. Extraction (or harvesting) at Stagecoach Trails Limestone consists of removing blocks or pieces of stone, accomplished by locating and creating breaks in the stone. Dimensional stone is then removed by heavy machinery for sorting and shaping to meet customer requirements. Stagecoach Trails Limestone products are either moved to a quarry storage area or transported to a variety of end users. Scrap, or stone of insufficient quality, is generally used for a crushing and screening process.